How are you since last week? I hope you had time to bake some fresh figs! I am sharing with you today a classic French recipe given by my grand mother. She told me that she was 18 years old when she made this chocolate mousse for the first time. She was in the kitchen of her grand mother with one of the best pastry chef of Saint-Germain-en-Laye. She sent me by snail mail this recipe few months ago already translated in English. She had the chance to live in the USA during 3 years, that’s why she speaks the Language of Shakespeare. This is not common for French people of that age! 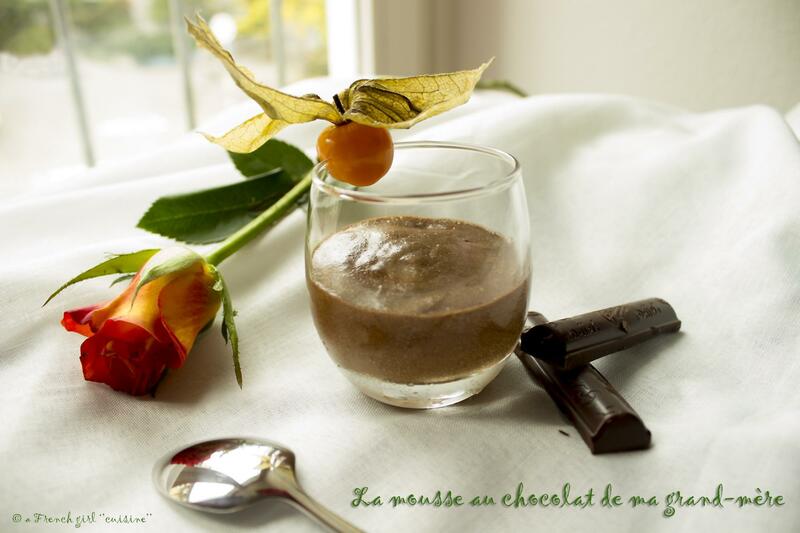 So Merci Mamie for this amazing chocolate mousse recipe! Melt chocolate and butter in top of double-boiler. Leave to cool. Cream egg yolks and sugar. Add melted chocolate and butter and mix. Folk egg in the chocolate mixture. At least 2 hours or up to 24 hours. This mousse au chocolat was simply delicious and now that I got the recipe, I will make it as soon as I get the opportunity. Right now I will take one out of the fridge to eat it in front of my favourite tv show! If you liked this recipe, do not hesitate to share it with your friends on the web. 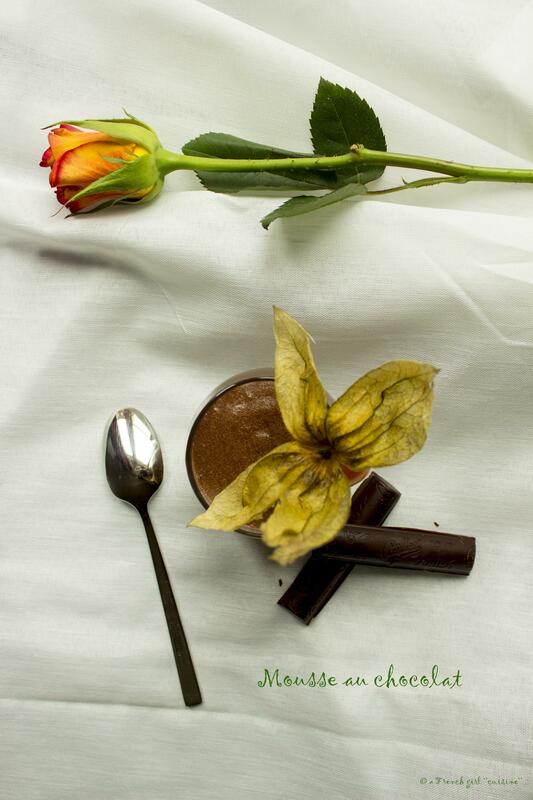 You can also follow a French girl “cuisine” on Facebook, Twitter, Google Plus, Pinterest or Instagram! How delicious! Chocolate mousse is one of the desserts I like best. I feel hungry just looking at your photos! Very nice! I really like your recipes AND the pictures! Nicely done. Thank you! I learn each day a bit more :-)! Fabulous photos! I am so dead jealous. How clever and artistic they are. Thank you so much!!! As I said I am just trying each day to do a bit more :-)! Thanks for stopping by my blog and for the like! I LOVE chocolate mousse. I can’t wait to try your recipe! Your grandmother’s recipe- I want to try it ASAP! 🙂 I have several chocolate mousse recipes– but your description has me sold. Great photos too. Thanks! Yes and as i said she sent it to me already translated in English!!! You had me at “black chocolate and butter”. This looks absolutely amazing! I’ve never made chocolate mousse and I’m dying to try it! Oh thank you really much!!! !